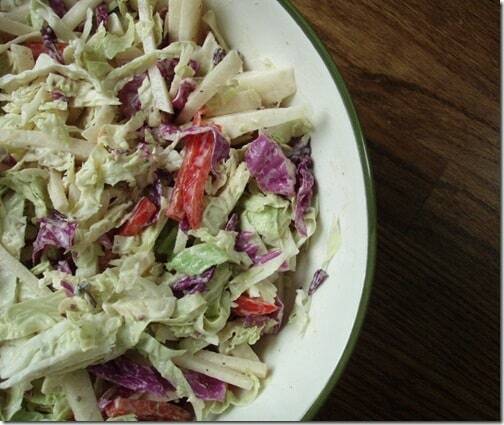 This Irish coleslaw is made with jicama, red pepper, cabbage and raisins and tossed in a yogurt vinegar dressing. First things first. Breakfast was too good not to share. 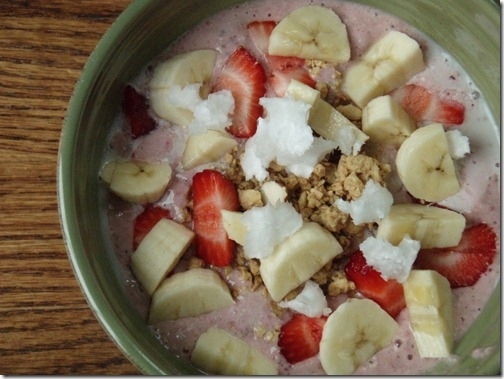 This girl knows what she’s talking about when it comes to smoothies. I’ve been wanting to try these dough boy smoothies for quite some time and yesterday morning was the day. Boy am I glad I did. Such a nice change of pace for breakfast. It really does taste doughy too! Those white clumps are coconut butter and definitely the best part. If you haven’t tried these yet, do it. But that’s ok because it’s only a 4 day work week for me. We leave for Ireland on Thursday night! We’ll be headed there for just over a week and plan to explore much of southern Ireland from Dublin —-> Cork –> Killarney —> Shannon. We’re going with Adrian & Doreen so you’ll be seeing a little bit more of those two. This is my first trip to Europe that we’re planning completely on our own and not with a group of some sort so, it will be interesting to see how everything pans out from driving our stick shift rental car on the other side of the road to figuring out how to get from city to city. I decided to get ready for our trip by incorporating one of the few foods I associate with Ireland (maybe I’m naïve but, what food is actually Irish?) into last night’s dinner. 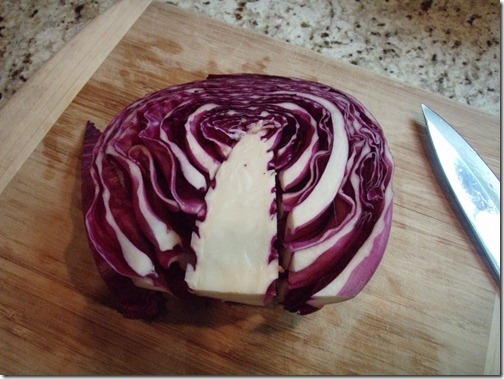 Cabbage! I’ll admit that my assumption of cabbage being Irish is based solely on the whole corned beef & cabbage St. Patrick’s Day tradition. So I apologize if it’s not but, I promise the recipe is good anyway! There were slim pickings in the produce drawer of the fridge and since we’re leaving on Thursday I really didn’t want to buy too much either. Enter this coleslaw/salad that I can make a ton of, will keep just fine for a few days, and satisfy my vegetable quota. Hope Ulysses likes it because it’s on the menu every night between now and Wednesday! Honestly, I don’t even know if I can call this a “recipe” it’s so simple. Simple is how I roll. I don’t have time for long, elaborate meals during the week while working full time and trying to fit in some sort of workout after 5pm. (Don’t even try and talk me into a morning workout. It will not happen. I can’t even tell you how many times I’ve tried only to totally dismiss the alarm clock when it goes off.) 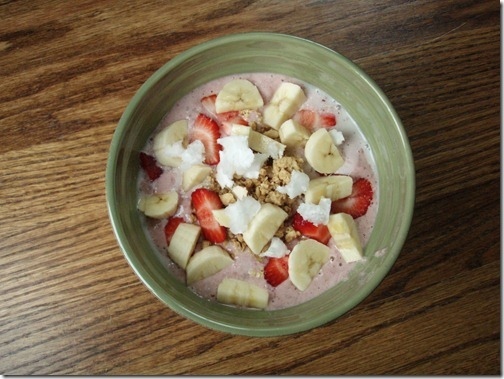 My goal is to try and keep it healthy, quick, and of course tasty. That’s it. I think this satisfies all three. 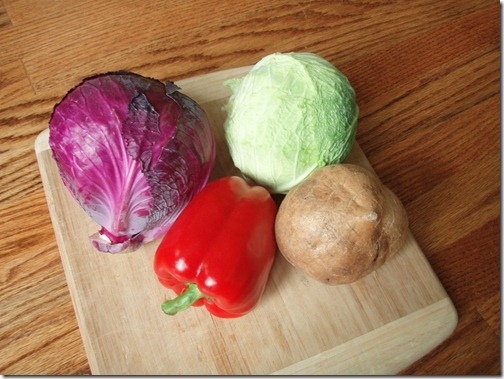 These 4 vegetables cost me $4.32 at my favorite store. I plan on having them last me for 3 dinners/lunches. Can’t beat that. This was actually my first time buying it. I’ve had it in plenty of store bought vegetable party trays but never bought it myself. 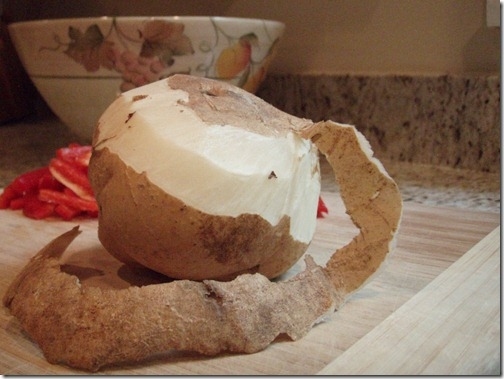 It looks like a root vegetable and you just peel the outside layer off much like you would a potato. 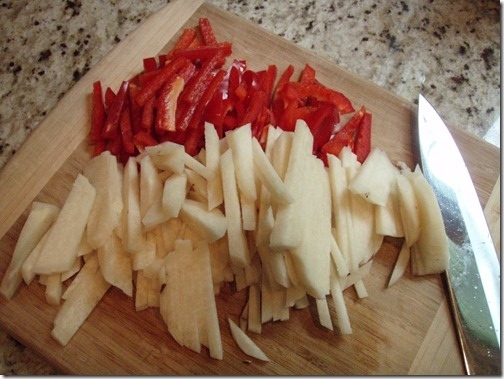 Once the jicama is peeled, just julienne it along with the red pepper. This is a loose interpretation of a “julienne”. No need to be perfect here. Moving onto the cabbage, I actually take out the white inner core as I think it’s kind of bitter and then just slice it. 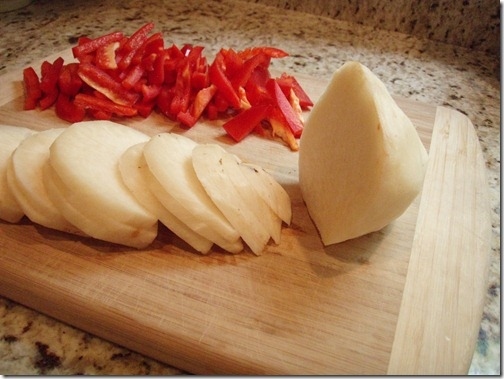 Add all your sliced vegetables to a bowl. I actually threw in some un-pictured raisins too for some sweetness. I also thought about adding a sliced up apple but then realized I didn’t have any left. Now it’s time for the dressing. This is where most coleslaws go horribly wrong. I wanted to keep this one light and obviously healthy but, I also wasn’t in the mood for just a vinegary dressy. I ended up kind of winging it and it came out great! Just pour the dressing into the bowl with the sliced vegetables and toss to coat. I let this sit in the fridge for a couple of hours but, there’s no reason you couldn’t eat it right away. I was alone for dinner last night and this was the perfect side to my grilled cheese and tomato sandwich. Now it’s time to start packing! Thinly slice all vegetables and combine in a large bowl with chopped raisins. Whisk together all dressing ingredients and add to bowl with vegetables. Toss to coat and serve or refrigerate. Have any of you been to Ireland? Any suggestions on things we must do while there? Never been to Ireland, but totally jealous of your trip. I do, however, have a visibly half irish husband: brown hair, red beard. Ireland?! SO COOL! Are you posting while you’re on the road? I’m dying to hear about your trip. I’m planning on posting as much as I can. Not sure what the internet access will be like at each hotel but I’ll try! I really need to stop reading your posts in the morning and keep it to lunch time. That looks delish! I usually make broccoli slaw with this light oil dressing and it’s so good, but I’m always up for a new version. How about the potato being an “Irish food?”…. maybe not all that “healthy” though. Looks yummy, but a bit “dangerous” for me! How exciting for the Ireland trip!!! I want some of that slaw. Wow! That’s big news. As you may or may not have noticed, that’s one of hte top destinations on my to-travel list. Enjoy the trip! Hi Jenny- thanks for stopping by! Hi Gina! I was just in South Africa about a month ago and drove a ton on the other side of the road. It’s not so bad. Ireland is tough though because the streets are so narrow. Make sure you hug the middle of the road or you will take out yours or someone else’s side view mirror. (I did that in 2008 when I was in Ireland – oops!) Have so much fun. And I’m digging the blog. Hi Taralyn! That makes me feel a little better :) I’m still kinda nervous about shifting with my left hand, I think that’s going to take some getting used to. 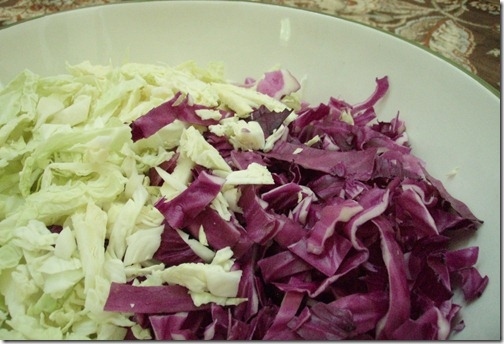 Thanks for the recipe for Irish Coleslaw! We were there for Christmas 2 years ago and I loved their Coleslaw! Ate it with every meal they had it. I have been trying to find a recipe for it ever since.